This is the chart of the eclipse over The Netherlands (August 1, 2008). If you want to read more about eclispes, go to Mar's Blog 2 (see left side, MY BLOGS). Sun, Venus, Mars and Neptune are prominent in the chart of Katie Holmes. With Neptune oriental she is the perfect dreamer to catch up with the beliefs of her husband, Tom Cruise. She lives with him, his mother, his sister and her children in one (I hope:) large house*). And it seams she is considering a move. Maybe that is because transit Uranus is opposition her Northern Node - for independency towards a group -? Or is it the progressed Sun getting close to Mars? I know that Sun-Mars progressions manifest the will to be self supportive and do your own thing. - and the fact that Ceres (symbol of heirdom) is conjunct his Sun and oriental. For the issue of living together it is nice to see that Tom and Katie share a Moon in Leo and feel comfortable in each others' presence. They share the same needs and are easily adapting to each other's habits. There is of course interaction between their charts. Some of the synastry-aspects will be helpful to keep the relationship going, others are not. They share Mars afflicting Uranus (he square, she semi square). Click for the article to find out what it means. Mars square Uranus is one of the indications in a male's chart for divorces. Tom Cruise already had one. Katie also has an indication for divorce: Venus conjunct Uranus (marrying impulsively). Katie Holmes married a man who is 16 years older than she is. Venus sextile Saturn is one of the tightest aspects in her chart. In marriage and relationships she prefers to have security. When she married Tom Cruise - who has Saturn in the 5th house -(on November 18 2006) she had transit Saturn inconjunct and transit Uranus semi square her progressed Sun. It is rather strange that she had a composition for restricted freedom. Another transit on that day is Uranus semi square progressed Mars. That is the same aspect that they share! It seems that the marriage iniciated a whole new adventure for both of them. The relationship with Katie made Tom Cruise very enthusiastic. He had the progressed Moon opposition Venus in 2005, when he fell in love and his Ascendant changed sign. In the first half of 2009 he will have progressed MC opposition Saturn and progressed Sun square Mars. That might be a good moment to split up with his family and start his own life. The Israelian Prime Minister Olmert will step back in October this year, with transit Saturn square his progressed Sun. Saturn is the symbol of (a.o.) separations, things coming to their ends and for breaking up. In August 2006 I wrote about OLMERT:"The Israelan prime minister Olmert was born in Binyamina at September 30, 1945. Today, during an expanding invasion of the Libanon, his progressed positions show an interesting midpoint combination. Progressed Mars is about 3 degrees Leo (when born at 12 it would be 3d4m56s Leo). Progressed midpoint Saturn/Pluto is at 3d3m47 Leo. This exact and direct midpoint combination usually refers to murder, death and killings and that is what is taking place. As you can read in the article about Mars and Pluto, there is no astrological indication for the clue in a 'who done it'.Fact is that Ehud Olmert announced that the militairy actions will be intensified and that fits with the astrological statement. You can also read the combination as 'die hard' Saturn/Pluto) fight (Mars). Nick Hogan (Nick Bollea), is a Formula D driver and the brother of Brooke Hogan and sun of Hulk Hogan, is in prison right now. He got 8 months for causing an accident in an illegal street race that killed one of the persons involved. Whenever there is an issue of limited freedom, you see a combination of Saturn-Uranus being activated. Nick was born 27th July 1990 (so he has only just become 18 years old!) with Saturn 15 degrees away from Uranus (a quindecile making us aware of the issue of limited freedom), a calling Sun that draws attention, Jupiter oriental for self confidence and travelling...and Pluto sesquisquare Aries Point for the price to pay and the treasure to win. Jupiter and Pluto are prominent and the midpoint Jupiter/Pluto is semi square the Sun. Jupiter-Pluto combinations point at succes. Just like a the chart of a coach influences the team, the chart of a national leader influences the nation. Money is related to the 2nd house. Saturn is related to short comings. Mr. Bush and his government created a deficit of billions. It will be his legacy to the nation. And what does his chart say of the financial situation? Transit Saturn has now entered the second equal house! That puts a heavy weight on financial issues. And he will be blamed (Saturn) for this. Saturn is important in the chart of the president. His Saturn is square the MC and calling (not making major aspects in orb 5 degree). Shaking, rythm, shock, excitement, news...all of these words belong to the astrological symbol Uranus. Uranus was tightly trine the Midheaven of the moment of the earthquake in LA, yeasterday. Ceres, mother Earth, is on the Midheaven. Luckily no one was injured and there was little damage. It is late for me, here in Europe, so I will be short about Ted Stevens, Alaskan senator, Republican, born 18th November 1923 in Indianapolis. He was a senator for a very long time, the longest serving Republican in the Senate. Now he has been accused of corruption and fraude. Why? And why has it been discovered now? Materialism: he has no placements in earth signs! Grease: Venus is inconjunct Pluto! No more than a year ago the progressed Sun was opposition natal Neptune and before, oppositon prgressed Neptune. I guess that that is when the investigations about him started and when he became a suspect. Transit Neptune has been conjunct the progressed Sun as well. Three times Neptune is a crowd. In his natal chart the Sun is connected to Neptune in a square of about 5 degrees. Conflicts between Sun and Neptune often turn out this way: the nativity is not what the people take him for. It is a conflict that is fortunate in the chart of an actor. In the chart of a politician it is not. I have to say that Obama has the same wide Sun-Neptune square. I don't think it means that he is a fraud. I think it means that reality and dream are fighting each other. Some people try to realise their dreams in a wrong way. Today I read that Britney Spears spends about 14.000 euro in a month on diets and training. Beauty (Venus) has its price (Pluto) when you have Venus square Pluto, like Britney has. On my site Astromarkt I published an article about Venus-Pluto ('The beauty and the beast'). Pluto often causes problems (and challenges) related to love, pleasures, beauty, preferences and realtionships. In the chart of Britney, the Venus - Pluto- square is very tight (within 1 degree of orb).Venus is the end dispositor of the MC-routing. This means that eing beautiful and estetics in general are part of the profession and the goals in life. See: the article about Venus and Pluto combinations om my site Astromarkt. Yesterday the eldest man in The Netherlands died. His name was Adrianus van der Vaart and he was 106. Last year he quit smoking and drinking (port) for physical reasons. He was born December 26, 1901. The positions on that day confirm my earlier findings. Now that he died you see Mars trine Saturn and square Pluto with Venus sesquisquare the natal Sun, for R.I.P, confirmed by a progressed semi square between Sun and Venus. About elements, signs and planets, the basics of astrology. NASA does not share the opinions of Dr. Edgar Mitchell, astronaut, on the issue of UFO's. Mitchell had an interview with Nick Margerrison on Kerrang! Radio. He said that aliens visited earth and that this had been covered up by the governments. He did not give any proofs, nor was he ‘backed-up’ by other astronauts. At least, although many pro-UFO sites say that all astronauts have seen UFO’s and think that they were alien. I have not found a clear statement on other sites. And as NASA says, it is an opinion. BTW It is NOT the first time that Mitchell tells us that he believes in aliens. Read this transcript of an NBC program dated...April 19, 1996*). Ceres (mother Earth!) is angular, conjunct the Ascendant. That means that the symbol of Ceres is crucial in his life. And I think it is astrological humor that the Moon is the end dispositor of the Midheaven. The MC is in Taurus, ruled by Venus, ruled by Pluto, and ruled by ….Moon! Mr. Mitchell is age 77 and holds the record of the longest even moon walk, on February 9, 1971. His progressed Moon (16d25 Cap) was opposition Jupiter (16d29Cancer) that day. His progressed Ascendant AND MC changed sign in the year of his extraterrestrial flight. Of course this event had great impact. His solar return for 1970 had Ceres on the Ascendant (like in the natal chart). And Jupiter (for succeeding) was on the Descendant. Soon after the event, he became interested in the paranormal field. That is some change for a scientist! The Sun, Ascendant or MC changing sign in progression has great influence. Sally Ride – Jupiter/Uranus square - Sun/Jupiter sextile. Yes, Edgar Mitchell has the Moon conjunct Jupiter and square Uranus. He also has Sun 112.5 Jupiter/Uranus, Moon semi square Jupiter/Uranus and Uranus square Moon/Jupiter. Monday 28th July, the Turkish court will judge the APK, the political party of the President (Abdullah Gül) and Prime Minister (Recep Erdogan). The question is whether this party is involved with political Islam. If so, the party will be forbidden. - Jupiter is calling (no Ptolemaic aspects in sign or orb 5 degrees). The combination of a prominent Jupiter and Neptune is the combination that is frequent in the charts of monks, popes and other persons with a strong spiritual conviction. Religion is such a conviction. On the day that he became a president the transiting Sun was in aspect with his progressed Jupiter and Neptune. The opposition in Turkey wants to keep the state and religion separated and is not happy with his president. Gül could expect problems within two years time, because the progressive Sun is going to make a frustrating sesquisquare with Pluto. The progressive Sun of Turkey changed sign in 2007 (when he became president). And the progressed Sun of Turkey will be square Saturn before 2009. It seems that 2009 won't be the best year for the nation or for the leadership. For the time being he has the progressed Sun sextiel Jupiter, but...Jupiter is inconjunct Saturn in his chart. There is no advantage without disadvantages with such an aspect. Recep Erdogan, the prime minister, was born February 26, 1954 in Istanbul with Sun in Pisces and Moon in Sagittarius. Those signs are being 'ruled' by Neptune and Jupiter, the combination for the spiritual conviction. It gives a religious or spiritual character. Transit Saturn opposition his natal Sun and Neptune (disposing of his Sun) opposition Pluto is reflecting the situation of today, with confusion and disappointment in hard times. This all does not look good for Turkey. But let's wait what happens on the 28th. Whatever happens, it might be hard and difficult afterwards. but they are cut in finances with 50%. Julia L. Parker wrote several books about astrology. What in her chart screams 'astrology'? She was born July 27 1932 in Plymouth, 17:00 hours. Neptune is calling0) and on top of her chart. That reminds me: she is an expert in explaning dreams. Pluto is oriental. And here we got Neptune/Pluto for the paranormal field. Uranus is 112.5 d away from Sun/Jupiter'; Jupiter semi square Uranus/MC and Uranus is opposition the Sagittarius Ascendant. Here you got 3 Jupiter-Uranus connnections. And Jupiter is trine Uranus. That completes the rule of 3! :) I have not seen an astrologer without the Jupiter-Uranus-combination, yet. John Cleese (born 27th October 1939 at 3:15 CET in Weston-super-Mare) had a bad relationship with his mother (and she lived to 101). 'I thought I'd never get rid of her', John Cleese recently told his audience. Really! According to the Daily Mail Online, click for the article...He also discussed the amount of money he has to pay his 3rd (!) wife with the public. John Cleese is a prominent artist. Neptune is oriental and Venus is sesquisquare Aries Point for the combination of Venus and Neptune: artistic talents. Acting might be contributed to the calling Moon. And Notice Jupiter on Aries Point, sesquisquare Mars. John Cleese has 5 out of 10 prominent placements in his chart. It is not fortunate, however, that Jupiter is in the seventh house...It means 'more than one marriage'. The Mars-Uranus square is another indication for unstable relations. Money is important in this chart: see the Sun in the second house of money, square the symbol of 'price and prize', Pluto. Venus in Aries (falling in love at first sight) and Mars in Libra (competition in partnership), an afflicted Venus or Mars (hormonal or sexual problems) and Jupiter in the 7th (more than 1...) seem not to be very helpful to keep a relationship going, either. The astrology of meeting each other. Sometimes you meet a perfect match at the wrong moment. For example, when you are young and there are indications for divorces. Or when you are married:) Read more in the article about meeting people and the effect of progressions and transits (on my site Astromarkt). Click the link. About sharing aspects with a partner. Sometimes people donot seem to be matching, but they share things (memories, goals, objectives) and those things are important enough to start a relationship or even to stay together for life. Read the article! In 2008 (see internet) most of the sites gave 21:15 for the hour of birth of Sonia Gandhi and so did my computer program. Now Astrodatabank mentions an AA rating for 21:30 (BC in hand VIA …) So, to be complete and to avoid wrong transits and progressions, I left out the text about T&P's and included that Astrodatabank chart too. It doesn't change the earlier text about her chart, but as it is been 5 years… Now I would like to add that the vital position of Jupiter refers to the international that she is (born in Italy, VIP in India). I also like to add that she and her husband had Mars square Mars (fire!). I had a special request to have a look at the chart of Sonia Gandhi, born Edvige Antonia Albina Maino. She is among the Time 100 most influential people, the widow of the former Prime Minister of India (Rajiv Gandhi) and the President of the Indian National Congress. Her chart is as impressive as her CV. On either side of the horizon you see Pluto (end dispositor of the MC) and Ceres. Pluto for the political ambitions and Ceres for heirdoom (the inheretance, the dynasty). Very important is the planet of writing and speaking: Mercury. Mercury is calling and rising before the Sun: she has written books and she was studying English in Cambridge when she met her husband. Mercury is the symbol of communications. Look at Jupiter square the Ascendant for the international! She was born in Italy and is a leader in India. She also has a calling Moon for the needs, the family affairs and the 'involvement' at any possible level. Moon, Jupiter, Mercury and Pluto are prominent and the combination of them tells us that she is an influencial, succesful and popular speaker. She is the widow of an assassinated PM and that is important for her position in Indian politics. See Mars sesquisquare Saturn and Sun opposition Uranus...In the charts of most women they would indicate divorce or more than one marriage. Gandhi however should certainly not benefit from another marriage, that would change her public involvement with the Gandhi dynasty through her name. On the 11th of July 1995 Mladic captured Srebrenica and ordered the separation of men and women. There was a mutual reception of Saturn and Neptune, with Mars opposition Saturn, tightly. Srebrenica was the so called protected UN area in Yugoslavia that was captured on the 11th of July 1995. The Dutch government had agreed – and one might wonder why, in such conditions and without support - to protect that little dangerous spot in already Serbian country. It was a bad day for the people there and a black day in Dutch’ history. About 8.000 men were separated from the women and brutally murdered. I will never forget a documentary about the events. There was a shot with two young men. They were friends, they had the same age as my son at the time, and they wore jeans and Nikies. It was as if I saw my son and his friends walking. They had their arms around each other and death was in their eyes when they were forced to walk towards their last minutes. The arrest of Karadzic brings this memory back again. The boys never came back. It is a shame that this happened in Europe, in 1995. On that day Mars was opposition Saturn (hard aggression) and Neptune trine Mars and sextile Saturn (easily covering up the violent events). Like in the chart of Mladic (who’s Neptune is opposition Aries Point) Neptune plays an important role in the chart of the massacre of Srebrenica. The leading officer of Dutch Bat was pictured toasting with Mladic. Pictures and alcohol also are part of the symbol of Neptune. JUSTIN TIMBERLAKE will be on stage of the Fashion Rocks-concert in New York this year, in September. Justin Timberlake was once the partner of Britney Spears. It looks like it was a good match. Her Moon is conjunct his Sun! Her Venus is conjunct his Venus. And still...it went wrong. Maybe because of her Venus inconjunct his Ascendant, but most probably because they were young and in their charts you see the indications for having more than one serious relationship. *) Justin now has a relationship with Jessica Biel. Nevertheless, Justin and Britney will be together: at work. This thanks to Madonna, who asked both of them to join her tour. Justin Timberlake has a few things in common with other male beauties. He was born January 31, 1981 at 18h30 CST in Millington. His Moon is oriental and that is attractive. Mars opposition Ascendant gives him the looks of a 'real man'. Venus is in the cool (...) sign of Capricorn, just like in the chart of Brad Pitt. And for being extra cool Justin has Venus in mutual reception with Saturn. That connects beauty and women to business. Justin has Sun semi square Venus/Uranus for special beauty and a few indications for success related to beauty and being fotogenic: Venus semi square Sun/Jupiter and Jupiter square Venus/Neptune. Justin Timberlake is an Aquarius and his Ascendant is Leo. *) He has Mars square Uranus and Moon conjunct Neptune. She has Sun conjunct Uranus. Indications in male's charts are afflictions/conjunctions of Moon-Neptune, Moon-Saturn, Venus-Neptune and Mars-Uranus &/or between the houses and rulers of 1 and 7. Indications in the chart of a woman are afflictions/conjunctions of Sun-Mars, Sun-Uranus, Venus-Uranus and Mars-Saturn and/or between the houses and rulers of 1 and 7. Manmohan Singh is the Prime Minister (P.M.) of India. He was born 26th September 1932 at 14.00 hours in Jhelum (so I am told). On the 22nd of July he won a motion of confidence after accusations of bribery. That corresponds with the 'Thank God'- combination of transit Uranus opposition progressed Jupiter. And with transit Jupiter square progressed Ascendant (a success), together with transit Neptune semi square the natal Ascendant for the suspicion. He made it...this time. But there are difficult transits of Saturn on the way! No matter what birth time, Mr. Singh has prominent and oriental Mercury (rising before the Sun and opposition Aries Point) for communicative skills. He also has two tight aspects in his chart: Sun sextiel Mars and Jupiter conjunct Neptune. The Jupiter-Neptune combination might point at a spiritual conviction or at the audience that he has (perhaps followers or fans). Mr. Singh is the first sikh in his position. Pluto seems to be of importance for the moments of change in his career. In 1989 his Pluto (retrograding in progression) returned to the position at birth (Progressed Pluto conjunct Natal Pluto). That was in the middle of the transformation from bank manager to minister of finance. In 1963, when he became a professor, Pluto started retrograding. The importance of Pluto in respect to his career fits the nature of his working field: financials. Pluto makes a wide square with the Midheaven, so how could Pluto be so important, one wonders...Look at the midpoint Sun/Moon (the point that indicates where your heart lies) and see the semi square with Pluto...His hearth lies with politics, power, influence and money. Pluto is connected to Sun/Moon and so are Uranus (and Neptune if you take more than 1 degree of orb). It means that Uranus, Neptune and Pluto are connected in his chart. It is a generational combination that points at the catastrophes and dramatic changes experienced by his generation. On the 22nd May 2004 he became the PM of India. On that day transit Jupiter was trine Ascendant (and conjunct Jupiter) and Mars opposition Ascendant. Mars-Jupiter-Ascendant is a trio for success! Provided that this is the correct birth time, Saturn is tightly square the Midheaven. Most of the time the Midheaven afflicted by Saturn is not a fortunate aspect. It usually points at a fall down at any time in life, due to too much ambition. As such a step back has not occurred in his life, it might be soon. In November 2008 transit Saturn will be conjunct his natal Sun for another moment in time to highlight his mistakes and the disadvantages of his way of life or failing physical conditions. Some step back with such an aspect. Saturn does not make major aspects in sign or orb 5 degrees. That makes Saturn (ruler 1! in the first house) a prominent planet. One of the qualifications that I found on Wikipedia was that he is a cautious man. The Capricorn Ascendant and the position of Saturn is certainly debit to that. There is another reason for concern if this is his birth time. His solar return chart has Saturn close to the IC (and Uranus close to the MC). The MC is in the 19th degree of Sagittarius, square the progressed Sun. So in November the transit of Saturn will also hit his solar return MC. BTW G.W. Bush also has Saturn square MC. He never stepped back. But there has never been a president less popular than he is...The position he has probably does not make him happy. I don’t know about Indian politics and polls, but the upcoming transit of Saturn with his progressed Sun could mean that it will be hard to keep the present quality of life of mr. Singh. In a way, the effect of the transit is already there with the needed motion of confidence. Naomi Campbell is beautiful and she has a problem with agression. She was convicted in March 2007 and she does not seem to have learned from it much. Whenever a progression or transit 'touches' her Mars, she cannot seem to control herself. Mars is biquintile her Ascendant and that makes her creative in the way that she expresses her anger. Early March 2007 Naomi Campbell was convicted: she had to clean a building for five days (after hitting her servant with a mobile phone). This happened to her with transit Saturn semi square to the progressed Sun & progressed Uranus. Transit Saturn was also sesquisquare the progressed MC. Notice the combination of limited -Saturn - freedom - Uranus -. Naomi was born 22nd May 1970 in Westminster at 1:00 a.m. Prominent in the chart: a crucial Sun and Neptune on the meridian (for movie star for example or for a double life), Venus on Zero Aries inconjunct the ascendant (for beauty that somehow does not match with the way she presents herself), a calling Moon (for fashion and needs/behaviour at any level). She has Jupiter on top (she is above all an international). There is a special combination in her chart. Venus is the Apex in a Yod with Ascendant and Neptune, pointing at the fotogenetic model that she is. Naomi is a prominent person with 5 prominent positions: Sun, Moon, Venus, Jupiter and Neptue...The pattern of a beautiful lady with a public and fans. But... the problem is that she also has Mars square Pluto (use or abuse of power, strength and influence….for example: using violence). In her progressed chart Mars is ruler 1 and in March 2007 this planet was on the lowest spot in her chart. But what is the excuse this time? As an international (Jupiter) she caused problems in a German hotel where she destroyed a sheet and refused to pay for the damage. That happened with transit Uranus square progressed Mars (progressed ruler 1, again). I guess she was a bit irritated and exploded...And I doubt that this will be the last time that we heard of such an incident this year. Her solar return chart has Mars conjunct the IC! Life has not been easy in the eyes of Peaches Geldof, lately. She has Saturn conjunct Neptune in the 13th degree of Capricorn and both quintile the natal Sun. About 2-3 years ago there was a square between Sun and Saturn-Neptune. That is maybe when the problems started. With her Sun in Pisces and Moon in Cancer and with 50% of her placements in water signs she hardly can resist the party scene and she will easily give in to bad habits. Her Saturn-Neptune-connection is BTW square her father's Sun (conjunct Saturn/Neptune) and Uranus. Peaches Geldof's friend saved her life when she almost died due to an overdose, yesterday. That was with Jupiter square progressed Sun, Mercury and Venus and inconjunct progressed Mars. Her progressed Sun is getting closer to a semi square with Jupiter. Sometimes when there is intervention to be grateful for, coming from an advisor, a friend, a doctor or the law, Jupiter is there. And Peaches has reasons to be grateful. BTW With her progressed Sun conjunct progressed Venus it is not surprising that she had a debut modeling. Two persons in the news these days and the item is freedom or not: Aung San Suu Kyi and Radovan Karadžić. They were born on the same day and I don't have the hours of birth. Karadzic has been arrested yesterday. He was one of the most wanted war criminals. Like Aung San Suu Kyi he lived with limited freedom. As he was wanted since the 90's, he could not move freely and had to be vigilant. In 1990 Aung San Suu Kyi won the elections and that was the start of her detention. That is what Aung San Suu Kyi and Kardzic 'share': the restrictions. Here you see the chart of Aung. Mercury is also prominent because of the position square Aries Point. The combination of Sun, Mercury and Uranus is the combination of the will (Sun) to have an independent (Uranus) opinion (Mercury)." I also like to point at the Sun in their charts. The Sun does not make Ptolemaic aspects in sign or orb 5 degrees. The 'calling' Sun in their charts is telling us that they want to be noticed and that they might be a leader. Aung San Suu Kyi, a non violent activist, was in the newspapers yesterday. Karadzic was arrested. The sun was semi square their oriental Uranus and highlighted issues of freedom. Within a year Uranus - prominent in their charts - will be square the natal and inconjunct the progressive Sun. The birth hours of the two politicians are unknown. So we do not know the crucial placements, the degree of the Moon, the Ascendant or the Midheaven. That information is crucial. Birth charts, transits, progressions and solar return chart or solar arcs...they do not judge. Circumstances, culture, gender and genes have an important effect on what a person does with the characteristic that are given in the chart. Karadzic's father spent most of his life in jail, for example. And Aung's father is an honoured general. The difference in their lives is clear. Karadzic is responsible for the death of thousands of people. Aung is non violent. But there are also many things that they have in common. She is a writer. Karadzic is a poet (notice Mercury square Neptune). And both spent many years in house arrest. Aung in her house. Karadzic in his region, hiding from the authorities. Statistics don't work the other way around. But sometimes that is so, because there is an important difference. To prove this I present the chart of Dinko Sakic, born 8th September 1921 in Maribor. He died yesterday, in prison. In 1998 he was convicted for the crimes that he committed in World War II. There is difference in the positions on his birthday, compared to those of the captured or extradited camp guards of my posts of last week. They often have at least Sun or Moon in Cancer or Pisces and a (sometimes slightly) over average amount of placements in watersigns0). This difference does not contradict the findings at all. Because there is also a difference in position in war time. Dinko Sakic was not a follower, he was a leader. He was one of the men in charge of the fascist army 'Independent State of Croatia' and he was the chief of the Jasenovac concentration camp. The other 'biased criminals' were low fish. He was a (captured) shark. Let us have a look at his astrological I.D. On his day of birth there were no placements in air signs. That can make a person rather unreasonable, though talkative. Dinko's chart was an earth and fire mix, he was creative, he was constructive and he was clever. His Sun is calling (no major aspects in sign or orb 5 degrees) so that he drew attention and became a leader. Mars is calling, too, so that he became a fighter. And Neptune is calling to complete the combination of the criminal (Mars-Neptune) leader (Sun). Watch the oriental Ceres, the symbol of heir doom and inheritance in this chart of a nationalistic person. Still, there is some "Pisces influence" connected with the crimes that he committed. Dinko Sakic had progressed Mars opposition Uranus in Pisces and progressed Sun inconjunct Uranus in Pisces in the period that he was commanding the prisoners camp in Croatia. In 1998 he was extradited and convicted. That was when his progressed Sun changed sign...and was quindecile (105 d) Neptune. Now he died, an old and very ill man, with transit Saturn opposition progressive and natal Uranus, and progressive Saturn inconjunct progressive Uranus, in prison, like a lot of his victims. His death is accompanied by Jupiter trine Sun (possibly he was happy to die, given his condition). I know that there are astrologers who see Pisces as 'soft' and Virgo as 'docile'. I don't. You can have leaders and servants or followers of all sorts and kinds. Leaders often have a prominent Sun and so had Sakic. These are the birth positons of Aung San Suu Kyi, leader (notice the 'calling*) 'Sun!) of the Burmese opposition who has not been allowed to leave her house since she won the elections. Mercury is also prominent because of the position square Aries Point. The combination of Sun, Mercury and Uranus is the combination of the will (Sun) to have an independent (Uranus) opinion (Mercury). Aung San Suu Kyi is in the newspapers today, because a Burmese minister said that she might be released in about half a year. Not long ago Ban Ki Moon tried to talk her free. Within a year Uranus - prominent in her chart - will be square her natal and inconjunct her progressive Sun. As her birth hour is unknown it is not clear when exactly. And an inconjunction (quincunx) always involves 'besides' and 'but's...'. The Birmese government has shown before that their place in society values more than the freedom of the inhabitants. Click for the former post about the Birmese situation and the chart of Than Shwe. *)calling: without major aspects in sign or orb 5 degrees. The Sun symbolizes leadership or drawing attention. UPDATE JULY 22nd: the same minister now says that he was misunderstood and that it will be late 2009 before she will be free. Björn Ulvaeus lost his memory, all of the sudden. Lost is symbolised by the quincunx and by Neptune, symbol of the amorphous. In his birth chart (he was born 25041945 in Gothenburg Sweden) the Sun is inconjunct Neptune (and Saturn is square Neptune). The inconjunction symbolizes the mismatch between health and vulnerability or sensitivity. As Neptune is also the planet of the artist and of music, it might well be that music did this to his memory. It may sound odd, but I remember a night in the theatre with drum sessions, very loud, for 2 hours. Afterwards my husband and I could not remember passwords and the code to block the alarm system in our house. We had to join forces to find them and we could not pin money that night. We decided never to repeat such a night, because it was rather scarry to not be able to remember things that you need to know. It came back in a few hours, but...what if you are sensitive and hear these rythms all the time? Björn Ulvaeus IS sensitive. He is an artist and rather obsessed by music: Venus is quindecile Neptune (Venus 165 d Neptune). Now that the progressed Sun is getting closer to Saturn, the failing system is in the spotlights. The period with progressive Sun conjunct Saturn is not the most easy period in life...Limitations and restrictons are part of the experience. Saturn is connected to Neptune; the combination Saturn-Neptune often refers to being sick or ill.
Of course, I am not a doctor! But I like to tell you what the effect of drum beats could be. Take care! My latest post was about the influence of water signs when it comes to 'wanting to be part of it' or 'being involved' in a group. Yesterday I visited a zoo. The 'ocean part' of it contained an explanation of the advantages and disadvantages of swarms. I think that that explanation about swarms could be used to explain the tendency to 'go with the flow'. That tendency is one side of the water signs Pisces and Cancer. So, I thought, NOT having water signs could have the opposite effect. Having over 30% of the placements, included Sun and/or Moon, in water signs can easily bring a person to 'going with the flow’. Gwyneth Paltrow was born 27th September 1972 at 17h25. (Some sites mention 28th of September, but most say September 27 and so does Astrotheme) She was born in LA. She has a lot of placements in air signs, the signs of communications. Pluto is oriental in her chart (rising before the Sun). Issues of influence, money, sexuality, life and death, strategy or politics are the issues that she is orientated on. (BTW I like the Jupiter-Neptune midpoint combination with the MC. It is the combination for those who work with a believing audience, like movie stars do or in the case of religious vocations). Noel Tyl mentions that Pluto oriental, rising before the Sun, is related to 'knowing the right people'. Gwyneth Paltrow became known and famous because she had a relationship with Brad Pitt. That affair lasted for 2 years. It was a mutual Moon-Ascendant relationship. Her Moon opposition his Ascendant. His Moon semi squares her Ascendant. And his Saturn sesquisquare her Sun. Attraction (Moon) and a goodbye later (Saturn)...They shared Mars square Jupiter (a drive to progress in life) and Mercury-Ceres aspects (she has the conjunction, he has the semi square, both nurture themselves with communications:). The relationship with Brad Pitt made her famous, but the fact that she remained famous can be contributed to her. Aribert Heim, a wanted war criminal born June 28, 1914 is probably still alive. The positions of his birth day and his progression offer some insight in the characteristics of a doctor who’s nick name was Dr. Death. The chart for that day corresponds with the charts of others who were involved too much and abused their power. It is believed that Aribert Heim, alias Dr. Death, is still alive, though rather weak. And the search for him, in order to make him face justice, continues…I have studied the charts of those who commit crimes in war times and I think that bias in cruel times, in addition to power to do whatever you like, is dangerous. I also think that a certain amount of placements in water signs indicates ‘involvement’ and ‘wanting to belong’, sometimes leading to bias. Bias can be used for the benefit of groups of people. And bias can lead to destruction. In times of war and suppression some collaborate because it is so much easier to do or because they simple want to be part of the majority. Others go further and commit cruel crimes. Heim is one of them. Aribert Heim, born 28 June 1914 in Bad Radkersburg (still alive today! )was very cruel in Mauthausen. His nick name is Dr. Death. The persons born on his birth day have a focus on issues of money, power, politics and influence (Pluto), are strongly committed to a cause or emotionally involved (water signs) and can easily use or abuse power and strength (Mars sextile Pluto). They are also likely to mix up facts and fantasy (Mercury-Neptune) and tend to be impulsive in their relationships or have a certain artistic ambition (Venus-Uranus). It depends on what planet is crucial in their chart. The symbol of that planet will be crucial in their life. As mr. Heim is called mr. Death, it might be a crucial Pluto. Pluto in his chart is close to Sun and Saturn. The combination of Sun, Saturn and Pluto can make a man unscrupulous, sometimes forces you to disregard signals of danger, and confronts you with the disadvantages of money, politics and power. See my article about Saturn and Pluto… on my site Astromarkt. He was born with an oriental Pluto square Aries Point (the most prominent planet), 40% of the placements in water signs (Sun in Cancer) and 3 tight aspects: Mars sextiel Pluto, Venus opposition Uranus and Mercury conjunct Neptune. Pluto was there when he became a Nazi. When WWII started (in 1939) his progressed Sun changed sign to Leo and his life style changed. That was also the year that of his promotion as a medical doctor. Not an ordinary one: he was trained by the SS and a member of the Austrian NSDAP since 1935! That was with transit Pluto conjunct his progressed Sun. In Mauthausen he committed such cruel crimes, that I will not mention them here. That was in 1941. As a memory he kept the skull of one of the victims he made, on his desk. Later he became a very skilled army doctor and saved the lives of many German soldiers. After the war there was a short period of incarceration and in 1949 he was released from prison, he married, became a gynecologist and owned houses. Heim managed to live an almost completely free life abroad. Jupiter is sesquisquare his Sun. Whenever he moved to another country the progressed Sun was in aspect with Jupiter. In 1962 he was traced by Simon Wiesenthal and fled the country (progressed Sun opposition Jupiter). He worked and lived in Latina America and in Egypt. In 1969 he divorced his wife (progressed Venus semi square progressed Sun). Since 1985 he is supposed to live in Spain (with Sun inconjunct Jupiter). His heirs have not claimed the 1 million euro on his bank account, so he is probably still alive and in Argentina or the southern part of Chili. This year his Sun is sesquisquare Jupiter, so maybe dr. Death is on the move again? Or will he do as his name tells him to do and finally come home (his name is Heim and Heim means home…) and face the law? I wrote an article on Astromarkt about bias. I would like to add something here. Below you see the charts of 3 persons, one man, and two women. I noted their birth data when a saw a documentary about grandpa’s and grandma’s in prison. They looked normal and nice, and no one could have suspected them of being the cruel guards in Majdanek. Pisces and Cancer were abundant in their charts. Being involved too much is one of the possible effects of these star signs. - Poncke Prinsen (Dutch soldier who walked over to the enemy Indonesian rebels and so lost his Dutch nationality) has 50% of the objects in water, Moon semi square Mercury and Venus opposed to Pluto. - William of Orange (the first, the rebel leader against the king of Spain_ had 40% of his planets in water, a conjunction of Sun, Moon and Mercury sesquisquare Jupiter. - Mordechai Vanunu (Israelian atomic scientist, told the world that Israel had an atomic weapon, was sequestered back to Israel and only after years he was released with severe conditions recently. 50% in water signs, Moon opposed to Mercury, Venus square Pluto. - Martin Luther King, the murdered religious black leader, had Moon trine Mercury and opposed to Pluto and 40% in water signs. - Mahatma Gandhi (spiritual leader during freedom fight of India) had 40% in water signs, Moon quintile Jupiter and square Pluto, Venus opposition Pluto. - Mohammed B., the fundamentalist who slaughtered Theo van Gogh (a man who was rather offensive towards Muslims in his blogs and on the radio), was born March 8, 1978 with 60% of the positions in water (40% in Pisces) and Sun square Neptune. - Lyndie England (8 November 1982, Fort Ashby, West Virginia), the abusive soldier in Iraq, has 40% in water signs (Scorpio) and says she had been influenced by her lover. The tightest aspect in her chart is Saturn conjunct Pluto (the disadvantages of politics and extremes). - Johann Leprich, born 7 July 1925, was working as a guard in Mauthausen (concentration camp) and has electronical surveillance since October 19, 2006. 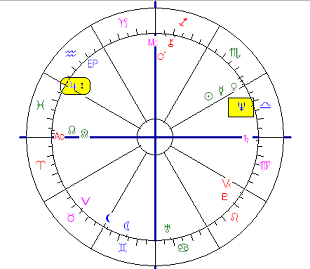 He has 40% in water signs, Sun in Cancer conjunct the oriental Pluto and Mars is tightly square Saturn. - Elfride Huth (14 July 1922 in Leipzig) has Sun in Cancer and Moon in Pisces. 50% of the positions are in water signs. She was sent back to Germany in September 2006, after the death of her Jewish (!) husband. In the Nazi-period she worked as a guard. It was so much easier than working in a factory... Mercury is square Saturn and semi square Neptune; Mars square Uranus and inconjunct Pluto. Pluto oriental. Do you see the patterns? In specific circumstances and of course when other indications in the chart confirm it, the bias (the involvement) shown in the natal chart becomes a rather mortal or otherwise important issue in life. In 'KPN Today' I found a message about two billionaires in India, brothers, Mukesh and Anil Ambani, owners of Reliance. They seem to fight each other and they should be each others opposites. The relationship has not been improved since father Ambani died in 2002 and Mukesh and Anil had to work together. They split the company in 2005. Up to now their mother has been able to keep things under control. But now Anil wanted to sell stocks. His brother says that he has the first right to buy them. If not, Anil would have become richer than his brother. The charts erected for the birth days of the men (found in Wikipedia) confirms the picture of Mukesh having a stronger personality. The charming side of Anil is shown in the mutual reception of Moon and Venus (ruling each other, in each other's sign). Mukesh Ambani is the eldest brother. He is born April 19, 1957 in Yemen. He is the 5th richest man on earth. They say that he is a typical business man. He has Sun in Aries and Moon in Sagittarius or Capricorn (I guess Capricorn). He is a hard worker with an oriental Moon (rising before the Sun). That places his needs in the first place. On the other hand, this Moon points at the importance of family and in particular the mother! Mercury and Saturn are calling (I call them calling, since they do not make Ptolemaic aspects in sign or orb 5 degrees) and that refers to communications at any level and at ambition, management and ....business. The tightest major aspect is Sun trine Pluto. At the very moment transit Pluto is trine his Sun and trine his Pluto. That does give him a better chance of winning the business fight with his brother. Notice that his Mars is inconjunct the Node and that 50% of his placements are in fire signs. His abundant energy has a sort of mismatch with 'community, family or organizations). This sort of struggle cost him a lot. Another tight aspect is Venus opposition Neptune and square Uranus. It points at possible artistic aspirations (but only valid in the eyes of the public with Venus and Neptune angular or on top). Funny is, that this combination of Venus-Uranus+Neptune might cause allergy and that I read that brother Anil uses lots of perfume. Also this combination is afflicted by Anil's Mars! It seems that Anil activates a physical or emotional allergy. Mukesh' attractive little brother was born June 4, 1959 in Mumbai (former Bombay). He is not so much different from his brother. He has the same prominent mother (Moon oriental). With 50% of the placements in fixed signs, he must have a strong will. Furthermore with Sun and Uranus, he wants to distinguish himself and be different, independent. So it must have been sour for him to have to do business with his brother. Right now his progressed Sun changes sign and so will his life style change. In 2005 the brothers split their business. That was when Anil had progressive Sun conjunct Venus (for pleasure:) and Mukesh had progressive Sun sesquisquare Neptune :(. Is it just coincidence that Venus and Neptune are 'in the game'? At first sight it may not seem a hard battle. But it is. Saturn, Uranus and Neptune of Anil are quindecile, septiel and sesquisquare the Mars of his brother. And vice versa the Venus, Uranus and Neptune of Mukesh are in conflict with the Mars of Anil! It seems that his mother has and had a hard time to keep peace! a. Pluto, related to Sun/Jupiter & Venus/Jupiter, and Aries Point or (Zero Aries) square Venus/Pluto on the day Mukesh was born. b. Aries Point sesquisquare vierkant Venus/Pluto $ Mars/Pluto + opposition Mars/Jupiter on the day tht Anil was born. I think the message in KPN today is not really fresh, since I cannot find international messages about the issue. Jon Voight (born December 29, 1938 at 11h50 a.m. EST in Yonkers, NY) is the father of Angelina Jolie, but they don't see each other any more. That is the reason why he has not seen or spoken his daughter about the recently born twins. Saturn is the symbol of parents, but Saturn is also the symbol of distance and growing up. Mars is the symbol of pain or hurt. The combination of Mars and Saturn in relationships often refers to a dead end story, as Mars-Saturn is the combination of energy that ends. This combination is what you see in the interaction of the charts of Angelina and father Jon. Jon Voight's Ascendant is conjunct Saturn. It means that he is representing himself as an adult, a responsible parent and with reservations. Often people with Saturn on the Ascendant tend to keep a certain distance from others. His Ascendant/Saturn is tightly connected with Mars of Angelina and also tightly inconjunct his own Mars. His Mars is also opposition Uranus. This reminds me of the twin's Mars-Uranus. Maybe, if they have a temper, they have it from their grandpa. Maybe Astrologyweekly is right and the description matches with Jon Voight's feelings guilty because he did not seem to care much in the past and now he cannot seem to show that he does. Mars is inconjunct Angelina's Mars. I have seen so many examples of Mars-Mars-conflicts with fighting people! This is certainly not a good aspect in a relationship. The quincunx shows that the competition or battle is unbalanced. That implies that he has the symbol of the Moon where she has Saturn. And separation from close family is symbolized by Moon and Saturn. So there is more than one reason why these two do not communicate. And there probably are even more...Here I only mentioned what immediately crossed my mind. THE CHART OF TED STEVENS 3xNeptune is a crowd! NO MORE SATURN FOR MCCAIN's BIRTH CHART?